Via Emilia started out in an FM 1960 location near the Champion Forest area of far northwest Houston, the same small shopping center that once housed the much-beloved watering hole, Matthias’s Restaurant and Pub, a mecca for craft and international beer long before “artisanal” ales and stouts became hipster turf. For many years this was a great location for the family-run, Northern Italian eatery. And the restaurant had the look and the feel of something out of a movie: a rambling sidewalk garden of potted herbs and vegetables out front; inside, a warm and inviting maze of rooms filled with racks of wine, plastic ivy, and flickering candles. So atmospheric, that during our then 12-year-old son’s Francis Ford Coppola phase, he insisted on wearing a full suit to eat there (because, of course, this is what Michael Corleone would have done). That was quite sometime ago, and in 2011, the Orioli family made the prescient move to a new frontier, the southern edge of The Woodlands, leasing space in The Woodlands Crossing Shopping Center at Kuykendahl Road and Woodlands Parkway. At the time, this area, which included a still sparsely populated Village of Creekside Park and the adjacent Augusta Pines community, was a “cloth napkin” food desert of sorts. If you were not willing to make the investment required for a night at the nearby Perry’s Steakhouse and if you weren’t in the mood for Thai food at Nit Noi, you were left with a selection of restaurants that mostly fell into the Do you want fries with that? category. For the exurbanites out this way who might not want to drive further north to The Woodlands Mall area or back south into Spring proper to find a good place to eat, Via Emilia provided civilization among the pine trees of The Woodlands’ “Livable Forest.” Now, with the exponential growth of both Spring and The Woodlands along that same Kuykendahl corridor, there are more upscale food choices popping up close by, but Via Emilia remains a go-to for many reasons. The restaurant’s dark walls and fixtures lend a cozy yet sophisticated vibe to the space. A shiny bar area lines one wall, humming with activity. A newer, adjacent extension is more “Mediterranean manor house,” with rustic brown faux-finished walls, family photos from the Old Country and Renaissance art. The room is strategically partitioned to create cubby holes of private seating for larger tables. There are other Italian places in The Woodlands, but at Via Emilia, there is a special undercurrent of fresh and homemade that permeates the menu. These are not cookie-cutter dishes, instead they seem almost straight out of that little trattoria you remember fondly from the trip you took to Italy a few years ago. A case in point is the simple yet utterly wonderful house salad, the Insalata Via Emilia: the brisk acidic bite of homemade Italian dressing over well-selected greens, slices of celery and red onion, wheels of ripe tomato and delicate fingers of avocado. I’ve eaten this same salad a hundred times, and the avocado is alway perfectly ripe, never hard, never mushy. I could just order a plate of this and leave happy, having experienced something so uncomplicated that has been done so well (but I never do). Other examples are the array of appetizers, such as the luxurious Pere e Gorgonzola: grilled pears, warm Gorgonzola, and candied pecans on a bed of spinach, splashed with a touch of Balsamic vinaigrette. Or the bacon-wrapped dates and figs that often appear as a special. 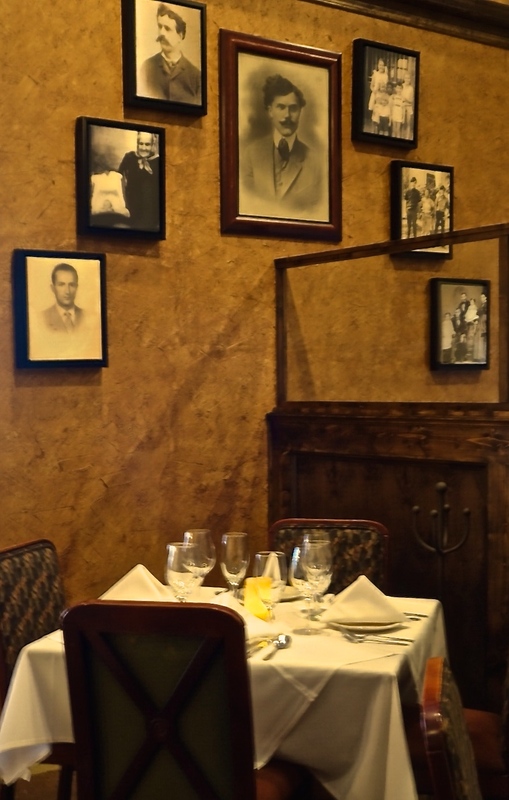 The entrees here are the classics of Italian cuisine, many of them Northern Italian favorites. The most notable dishes are the less ubiquitous members of the canon. 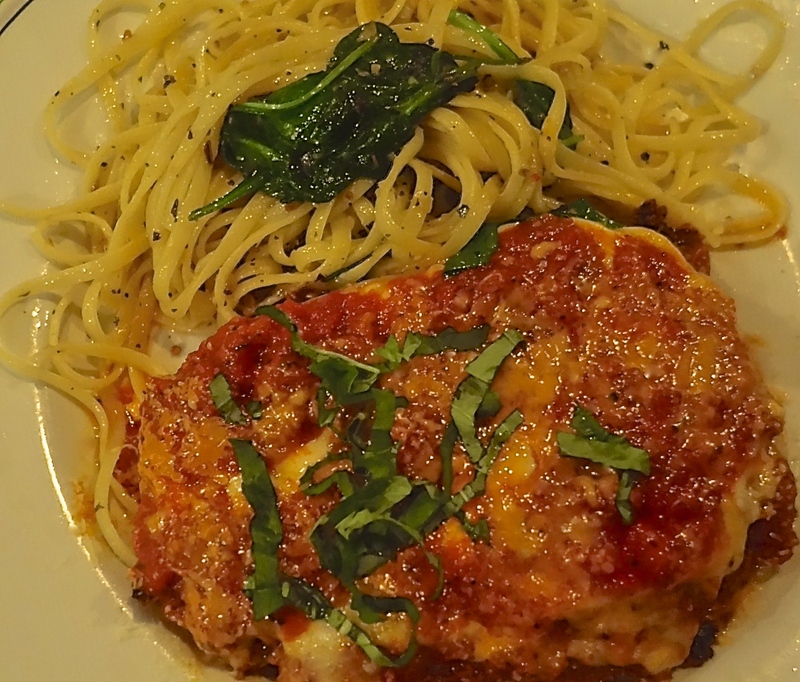 So when your Uncle Jim comes to visit–the one who always orders chicken parmigiana–yes, he can remain a creature of habit here and be satisfied. But at Via Emilia, he can also feel at home with equally traditional but even more wonderful dishes like the Ravioli di Formaggio– supple homemade ravioli filled with Ricotta cheese and spinach, or the Penne alla Parma–prosciutto, green peas and mushrooms in a creamy Gorgonzola sauce. Or, one of my favorite seafood selections on the menu, the Fettuccine al Nero di Seppia, homemade squid ink fettuccini pasta topped with a affable jumble of scallops, shrimp, squid, clams and mussels in a traditional Northern Italian red sauce. 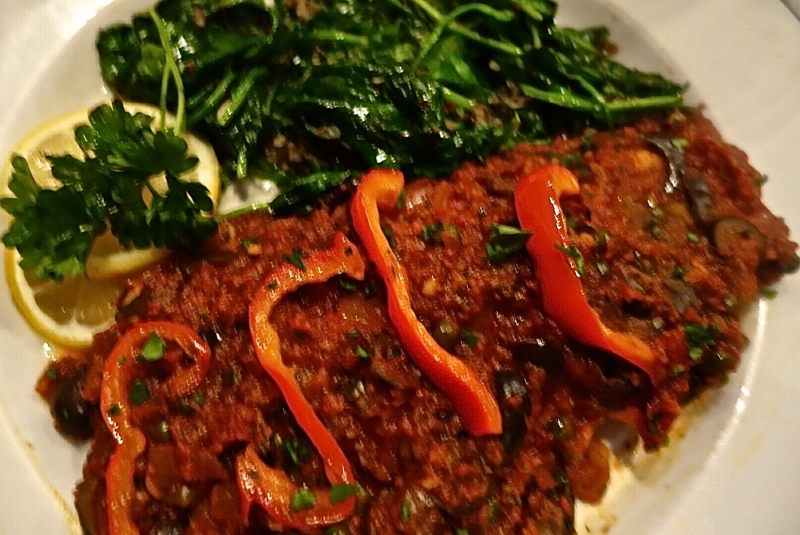 The kitchen consistently puts out superbly prepared fish dishes. Like the perfectly grilled red snapper and Chilean sea bass, both of which I have had here several ways, including a simple olive oil, lemon and caper sauce and a marinara topped with roasted red peppers. My favorite preparation is off the menu: grilled, then topped with marinara and a litany of seafood, served alongside your choice of pastas or sautéed spinach. The seafood tastes impeccably fresh, and the dish is finished with a subtle hint of lemon zest that adds a brightness to every bite. Braised meats are also a strongpoint. A special that continues to reappear by popular demand is the slow-cooked cabrito. And one of my favorites, the falling-off-the-bone-tender wild boar osso buco. Lovingly braised in a tomato-based sauce whose flavor is deepened by the intermingling of the juices from the slowly cooked meat, topped with a sprinkling of lemon zest, parsley and garlic gremolata. Another area that has come along beautifully in recent years is the restaurant’s wine list, which displays a remarkable depth and breadth of Italian selections as well as other Old and New World choices, a list rivaling some of the larger powerhouse restaurants out this way that pride themselves on the scope of their wine offerings. 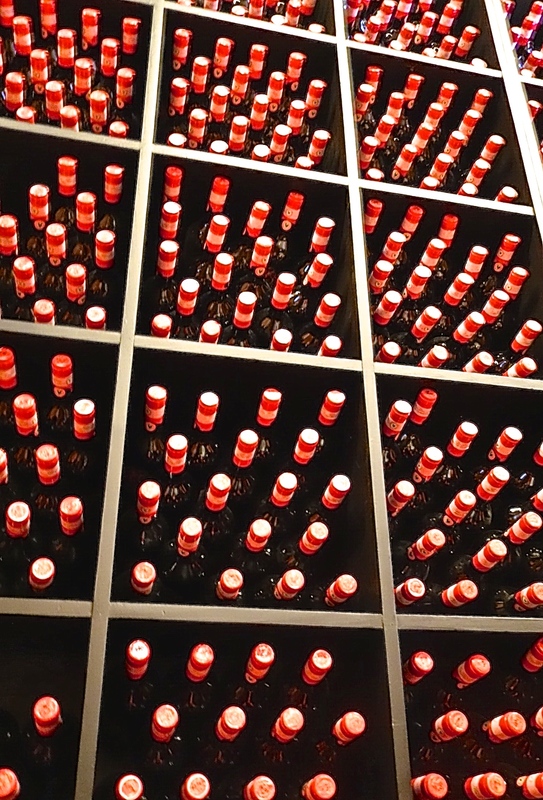 More than just the usual Super Tuscans and Chiantis, here you can get into the weeds, if you like, and grouse around in the substantial array of Barolos, Barbarescos, Amarones, Valpolicellas and Brunellos to your heart’s delight. (And on Wednesday nights you can satisfy your Italian wine fetish for half price.) 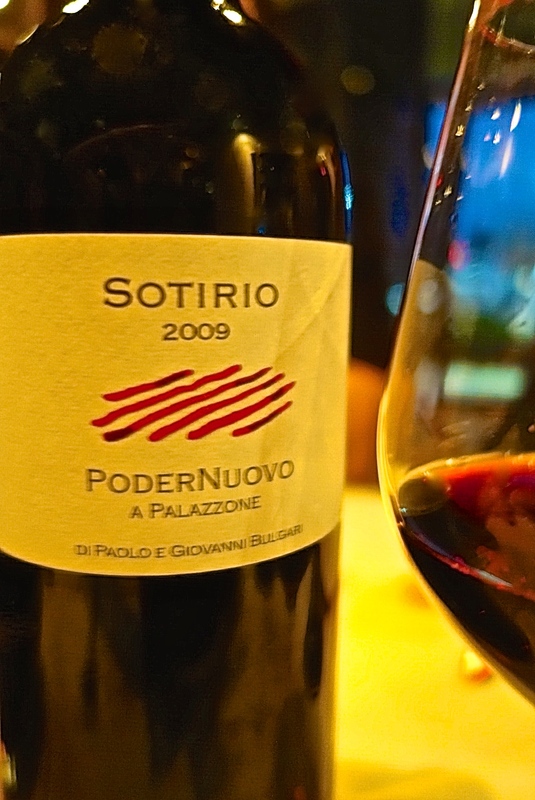 On a recent visit, our waiter, Steven, suggested the 2009 PoderNuovo a Palazzone Sotirio, a versatile, full-bodied Sangiovese that paired well with a variety of dishes at our table. This is a family place that uses its own recipes. The menu does not change on a passing whim. And neither do the waiters and staff, many of whom have been with the restaurant for years–like Bryan, who has waited on us for going on a decade, I’m sure. And when your evening is in the capable hands of long-time waitstaff who know their way around a table, know the dishes and the wine list back and forth, you’re going to keep coming back. It’s one of the reasons that some people in the surrounding neighborhoods are here every week. And why not? 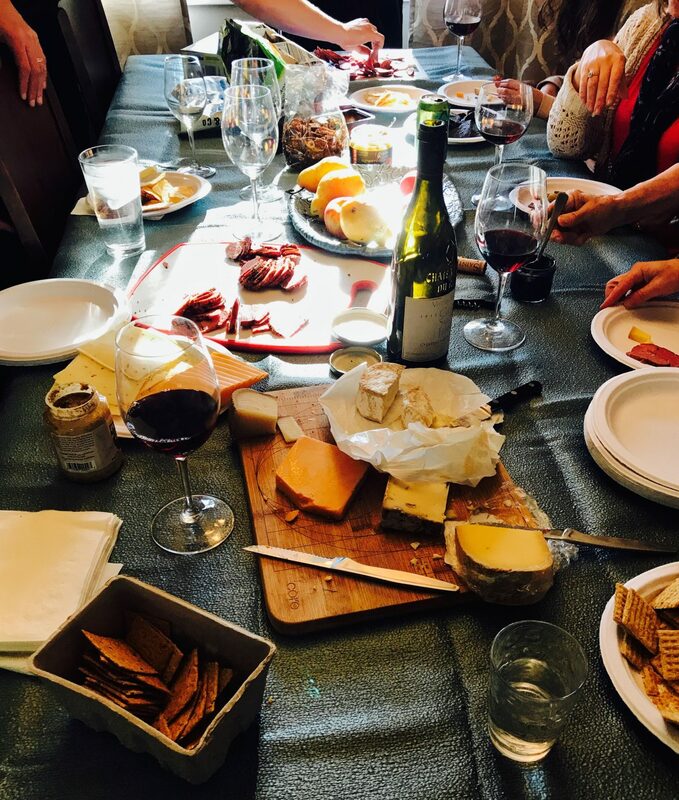 If you’re lucky enough to have in your own backyard a locally-owned, upscale Italian restaurant that provides so much attention to detail, so much connection with its patrons and such consistently worthwhile food, you’re going to be dropping by on a regular basis.